A pillow comprises flat bottom half cylinder fixed to a flat bottom half toroid and both components compose a single pillow. The flat bottom half cylinder fits directly below the neck providing an adequate support and stability to the cervical area. The flat bottom half toroid where the head rests provides the necessary flexibility. The inner elliptic space where the user's occiput rests is created between the flat bottom half toroid arms fixed to the flat bottom half cylinder. The inner diameter between the flat bottom half cylinder and the semi circular flat bottom half toroid elevates the user's occiput rests above the mattress. This graduation assures that the head and neck remain as aligned as possible in its top to bottom axis. The flat bottom surface stabilizes the half toroid fixed to the half cylinder providing full protection and stability for the user's cervical area. 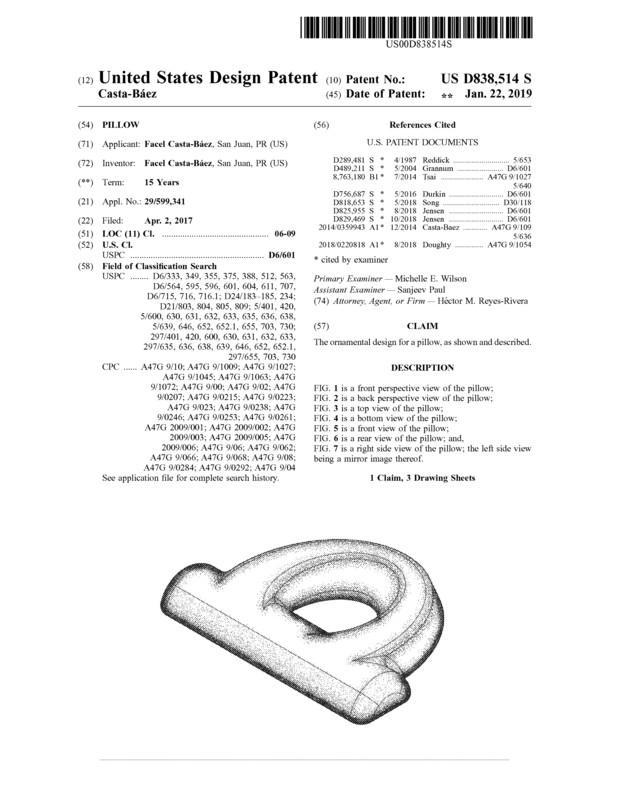 Page created at 2019-04-26 17:48:53, Patent Auction Time.